Kant How is a Synthetic A Priori Judgment Possible? Kant: How is a Synthetic A Priori Judgment Possible? This rather obtuse question stands at the intellectual boundary between the early modern and modern worlds. The question is the philosophical equivalent of a ‘shot heard around the world.’ You can find it at the heart of how we ‘moderns’ (among whom I include the so-called ‘post-moderns’) distinguish between fundamentally basic things like empirical fact and moral value. The question frames the boundaries of acceptable public debate, including where the line between public and private is drawn. It divides our cultural world up into progressive and conservative forces. The title question was first asked by a gregarious, though mild-mannered, Prussian (or German) professor of philosophy by the name of Immanuel Kant. Let’s first start with what a synthetic a priori judgment is. Kant divided all of the bits of knowledge floating around in a persons head into three types. The first, analytic a priori judgments, designate knowledge that are ‘self-contained.’ These are the sort of judgments that you can make in and of itself without reference to anything ‘external.’ An example of an analytic a priori judgment is ‘squares have four sides’ or ‘all bachelors are unmarried.’ Squares have four sides. Bachelors are unmarried. If the object didn’t have four sides, it wouldn’t be a square. The same goes for bachelors: if the man in question was married, they wouldn’t be a bachelor. They’d be a married man. This, of course, doesn’t seem like a very profound revelation. The intellectual traction of Kant’s argument comes when you start comparing the different forms of judgment. The exact opposite of an analytic a priori judgment are the synthetic a posteriori judgments. These judgments that you make with reference to ‘something’ external. Examples would include: ‘The sky is blue,’ ‘Kant was born in 1724,’ or ‘Game of Thrones is fantasy fiction.’ The sky might be blue. Kant might have been born in 1724. Game of Thrones might be fantasy fiction. All these things might be true. The difference in this case is that you will have to go and find out whether thus and such is actually the case. The sky, for example, might be grey or black, depending on the time or day or the weather conditions. Kant might have been born in 1723 or 1725. The sources that we possess might be wrong. And Game of Thrones might be better described as a medieval soap opera with fantasy fiction elements (like dragons, White Walkers, and shadows that look like Stannis Baratheon). Note carefully the differences. Analytic a priori judgments are necessary in that they are always everywhere true. Synthetic a posteriori judgments are contingent insofar as they can change as situations change — though they don’t necessarily have to. The question that concerns now us here is whether these two forms of judgment can account for all of our knowledge of the world. And evidently they do not. Take, for example, the prediction of a solar eclipse. We can predict when and where an solar eclipse will be visible with an amazing degree of accuracy. Our ability to predict, however, obviously does not fall into the category of an analytic a priori judgment. An eclipse is not defined essentially by its being visible then and there. It might be visible somewhen and somewhere else, but that doesn’t negate the fact that it still is an eclipse. Our ability to predict also does not fit into the category of a synthetic a posteriori judgment. What is at stake is our ability to predict that the eclipse will happen. We don’t need to wait for it to happen to see if it actually does. We already know it is going to happen before it does. Our calculations are good enough to predict these things. But how do we know it is going to happen? How can we be certain? Kant was fully aware of the significance of his question. In his book The Prolegomena to Any Future Metaphysic (1784), he charged all his readers to consider his question carefully before that made any metaphysical claims. In the term ‘metaphysical,’ he included claims about the nature of God (and presumably questions how many angels could dance on the head of pin) as well as the fundamental constitution of the natural world. If so-called scientists were going to claim anything with certainty about the world, Kant wanted them to show that they had understood what was at stake. Kant’s question (which was formulated with the help of Newton’s Principia Mathmatica, which first sets out, as we presently understand them, The Three Laws of Motion and The Law of Gravity) explains we no longer think of the planets as moving through an ether or think about heat in terms of phlogiston or think of biological species as always and everywhere the same. In the longer run, it explains why we don’t think the sun, moon, planets and stars evolve around the earth or that the orbits of ‘celestial’ objects are perfectly circular. The question puts a break on attributing divine eternality, or self-sameness (which takes the form of an analytic a priori judgment), to anything in the natural world. Once you do that, you start to observe how things actually behave. The question also directed people to think more carefully on those features of the world that they could claim to know with certainty. Kant intends his third category of synthetic a priori judgments to show how we can be confident in the predictive claims of modern natural scientific inquiry, which are peculiar for being both necessary in the sense that they purport to be always everywhere true, but which hold good for contingent situations that can change. How are they possible? 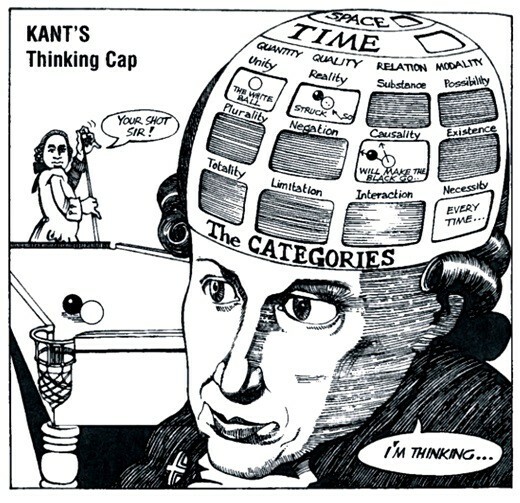 Kant says: by the a priori forms of perception, space and time, and the a priori categories of understanding, quantity, quality, relation, and modality. The latter categories need not detain us very long. Suffice it to say that they are a straight-jacket on Kant’s thinking in the way that they suppose the world can be combined and divided in order to make it intelligible. The former forms, however, are very interesting. To say that space and time are a priori form of perception is to say that every potential object of perception is locatable somewhere in space and time relative to other spatiotemporal objects (and so, by implication, is not divinely self-same). By every potential object of perception, I mean absolutely everything one might come across in the universe that is 14 billion odd years old and 10s of billions of light-years across. From the atoms to the primordial soup, to the Andromeda Galaxy and everything else in between. Kant didn’t explicitly mean this, of course. His conception of the actual dimension of the spatiotemporal extent of the universe was comparatively smaller, in line with the science of the times. But the basic principle, that space and time are a priori forms of perception, remain the same for Kant as it does for us. The actual dimensions of the universe are an a posteriori consideration — not something presupposed, but determined after the fact. So Kant’s question, we may say, helps to explain how it is possible for us to think of the universe and all things in it on these terms. The problem with Kant’s question, as Kant himself well knew, was that moral judgments regarding human thought and action always take the form of an analytic a priori judgment. Persons can marshal all the evidence they want to ‘prove’ that something is good or bad that they want, but at the end of the day we think things are good or bad because we think so. There is a ‘subjective’ element in a moral judgment that cannot be reduced to an objective state of affairs. Many reasons can be offered, for example, for why murder is wrong. Because another person’s life ends much too soon. Because you will go to jail. Because it is not conducive to social harmony to be arbitrarily off-ing members of a community. And so on, and so forth. But all of these are synthetic a posteriori reasons, none of which are ultimately persuasive in every case. If, on the other hand, we say that murder is wrong because it is a violation of an intrinsic human right — namely, the right to life — then we have offered an analytic a priori reason. It is wrong to murder a person because it is wrong to murder a person. The problem of moral judgments is actually a little more difficult than for which even Kant allowed. His question implicitly assumes that the human world can be divided into two separate worlds: ‘the starry heavens above’ (by which he meant the natural order of the world given in space and time) and ‘the moral law within’ (by which he meant something like a universally accessible, rationally determinable standard for moral conduct). This distinction creates a huge problem for moral judgment. Why? Moral judgment is applied to human thought and action, which is always and everywhere locatable in space and time. Take he case of murder. Murder is a grossly immoral act against a person’s body. Bodies are locatable in space and time. They just are. There is no way around it. There is no such thing are murder in the abstract. Jesus suggested that murder in one’s heart is tantamount to actual murder, but this is not a prosecutable offence. Same goes from stealing, destroying property, defaming, and so on. These are all acts committed against the bodies of persons or ‘bodies’ in a person’s possession. So in the case of the moral judgments regarding the specifically human body, you have this curious situation where divine self-sameness lives on in space and time. Kant doesn’t account for it. His question, in fact, cannot account for it. We ‘moderns,’ who like to think like Kant in these matters and pretend there is a hard and fast distinction between facts and values, aren’t able to identity precisely where the line between them lies either. We ‘moderns’ all can can agree in very rough terms about what constitutes a scientific fact. But we disagree vehemently about how these relate to our values — and, more specifically, to which set of values. People will always find reasons, of course, to talk past each other. The reasons they use today go back to Kant’s critical question. And that may help to shed some light on the present state of public discussion.